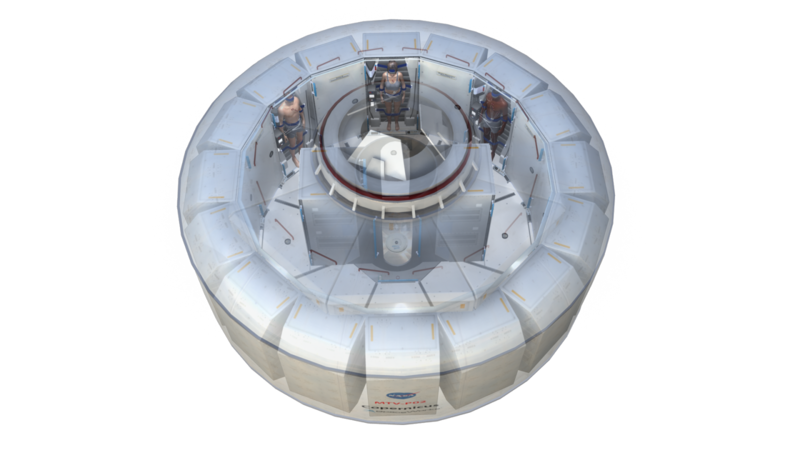 SPACE TORPOR: Artificial-Gravity Inducing Torpor Habitat! 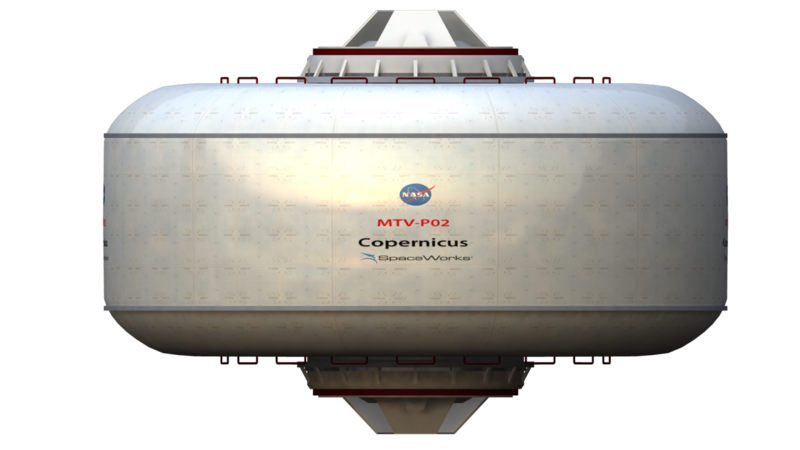 Here is a view of our torpor-based, artificial gravity inducing Mars transfer habitat. This features all the same systems, technologies, crew complement (6), and margins as our baseline torpor habitat module - however - it is able to rotate about its main axis. Depending on the rotation speed, gravity fields ranging from 0 to a full earth-G can be experienced by the crew. With the crew in torpor, we don't have to worry about uncomfortable gravity gradients and coriolis effects, so we can spin faster and with a much smaller radii than possible with a conscious/active crew. The total gross mass for the habitat is roughly the same as the baseline. Nice job from Mark Elwood at SpaceWorks Studios for illustrating this option for us! Would hair and nails grow? How much? Compare to such growth in astronauts. Yes, hair and nail growth would still occur. Response from Dr. Talk on our medical team: "Since all metabolic activity is slowed while in the Torpor state it would be expected that nail and hair growth would decrease at an equal metabolic rate. This would slow hair growth and nail growth by approximately 40-50%. If asleep for the entire 6 month trip to Mars, this would equal about 1 inch of hair growth and 9 mm (or about 3/8 inch) for nails." Can you provide further information on your comment in the FAQ document that "current human studies have shown the safety and medical benefit of Torpor for as long as 14 days straight and as many as 5 repeat cycles." Have those studies been published, or if not is any other information available? medical benefit of Torpor for as long as 14 days straight and as many as 5 repeat cycles." "Effect of long-term mild hypothermia therapy in patients with severe traumatic brain injury: 1-year follow-up review of 87 cases"
Journal of Neurosurgery, Volume 93:546-549, October 2000.